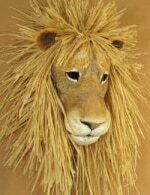 Note: I recently created a new lion mask pattern for paper mache. It’s a lot more realistic than the whimsical mask I show you in the video above. The downloadable lion mask pattern is made with cardboard pieces taped together, plus one layer of paper mache and that lovely raffia mane (made with a cheap table skirt). This display mask is the first project I managed to finish in my new house in Volga, South Dakota. I’ll take it down to the Brookings Restore tomorrow, right after the varnish is dry and the brass washer has been hot-glued to the back to reinforce the hole I made to hang the mask. It was fun having an “assignment,” of sorts. Since the art auction rules require that the artwork has to be made, at least in part, with items purchased at the Habitat for Humanity’s Restore, it pushed me to be a bit more inventive than usual. It was also fun walking around the store, looking at all the stuff they have in there. (While I was looking around at the Restore, I bought a really cute little reclining chair for $16!). I like a matte acrylic varnish – a number of different companies make it, and you can almost always find it at art stores or online. Wow Jonni, did you paint those eyes or are they glass eyes? Love the colorful creative approach, I’m having a real blast trying to find ways to recycle things and this is a nice inspiration! Hi Soul. Yes, the eyes were painted. They aren’t even the same color, since I sponged the various colors on the mask without considering the underlying form, and then added the pupils later. Oddly enough, it worked! I think I need to play around this way more often. Your lion is great, the use of the wires is very inspirational. Thank you so much for all the sharing. Hi Monica. I took the lion over to the ReStore yesterday, and they were very happy to see him. It was a really fun project – now I’m trying to think up more things to make out of recycled stuff. Any way we can see the show, with your lion, online? Can’t wait to see what you come up with using recycled stuff, Jonni! Plenty of inspiration at the ReStore, eh? it is so nice to see you back at the artistic creations again! I’m glad things are getting settled for you once more!!! What a fun sculpture! I hope your electric lion amps up sales at the auction, gives them a real jolt! I love the ReStore! I use ours for all sorts of projects, and love browsing with my mind open for inspiration! Glad to hear you are settling in ok and the creativity is starting to flow again! 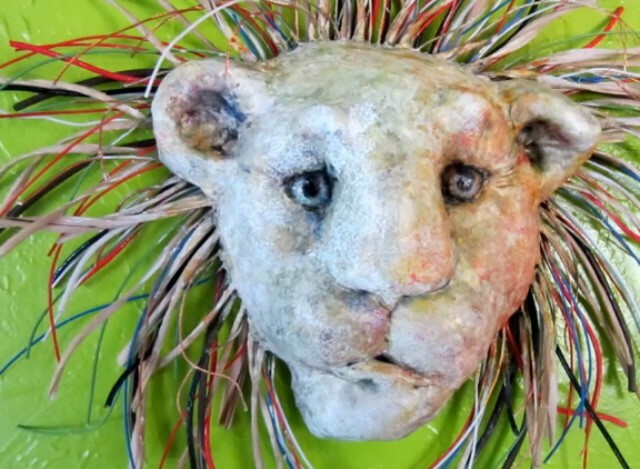 Loved the Lion mask and your use of electric cable for a mane! You always come up with some grat new ideas! I hope your move to South Dakota is a good one for you. You are such a delight 🙂 Love hearing about your moving experiences . The lion is wonderful. I use to give those electrical wires to my grandsons to make stuff with…brings back memories. 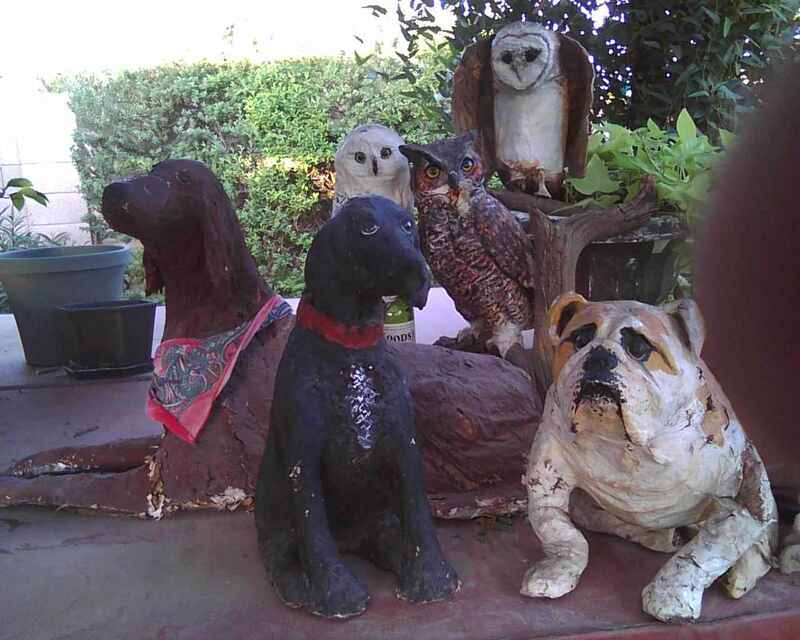 If I could just figure out how to get a picture from my cell-phone onto your site I would love to share pictures of my papermache things that I did some 20+ years ago that are in still pretty good shape Just love you and your Website ! Hi Nancy. I’d love to see those sculptures, but I have no idea how to do the cell-phone upload thing. Maybe one of our other readers could give us a hint? Click on the “Browse” button under the comment box. That will open a small window that lets you go to the place on your computer where you saved your photo. Select the photo, and click the “open” button. Then save your comment, and your photo will automatically appear in your comment, if you saved it in a small enough file size for the system to accept it. Give it a try, and see if it works. Oh Boy ! I will try this in the morning…Thank you, thank you! I love these dogs – especially the bulldog. Great characters! How big are they? Ah, he’s so cute. I like his wire mane and how you recycled materials. Good luck with art auction. I’m sure someone will love him. I just finished a paper mache project myself that will be in a Halloween show, starting October 13th, 2012( http://melissakojima.blogspot.com/search?q=conjoined+twins+paper+mache ) . Hope you’re enjoying your new place and town. What a great sculpture! Thanks for telling us about it. Ah, thanks for checking it out, Jonni. 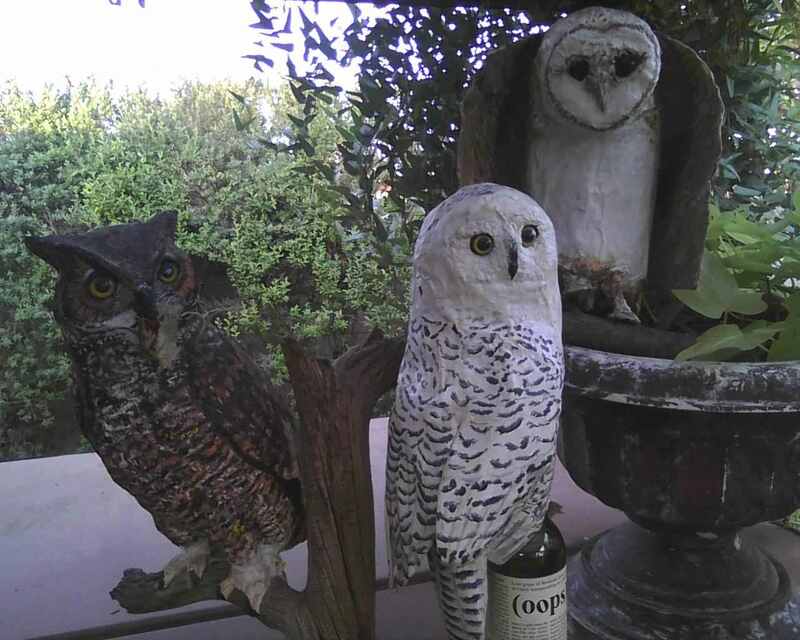 Love being part of this paper mache community. Jonni, I LOVE him! The Electric Lion is so colorful and pretty! How fun! Thanks, Terry. It’s good to be back!